What Else Makes ConvertKit Awesome? Why Is ConvertKit Better Than MailChimp For PPC? So Why Shouldn’t You Switch? Like most people, I started collecting emails using MailChimp (coupled with SumoMe) as my email service provider (ESP). Why? Because it was free (up to 2000 subscribers). Then I realized I needed some automation, so I upgraded MailChimp to the $10/month plan. But then what if I go from talking about AdWords to writing about Facebook Ads? Are these people the same audience? Do they want the same emails? Sure there’s probably a lot of overlap, but not 100%. With MailChimp, I would have to create a new ‘list’ and start from scratch. 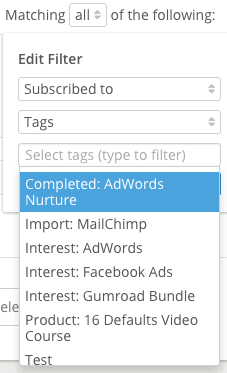 With ConvertKit, you can just tag people based on what they open or click in your emails (indicating they are interested). Let’s pretend for a moment that I did have separate lists on MailChimp for AdWords and Facebook Ads. What if I want to send an email to both lists at once? It’s nearly impossible.. so you end up sending the same email to both lists. But you have a bunch of overlap (people on both lists), so they get your email twice. That’s not good. 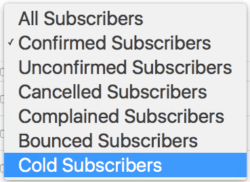 Plus they count each email in every list as a separate subscriber, so you potentially pay for the same person 2, 3 or more times. 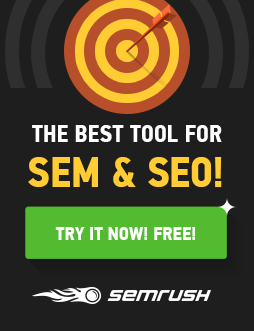 Do you see why ConvertKit is so much more powerful, user-friendly and customer-friendly? You actually get more subscribers for the entry-level price: $10 for 500 on MailChimp vs $29 for 1000 on ConvertKit. 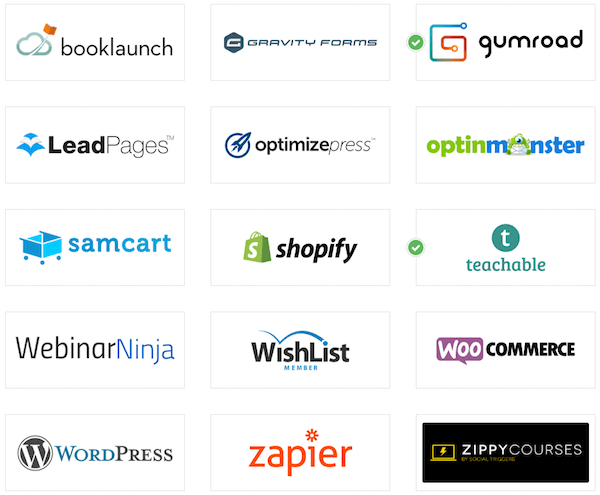 ConverKit integrates nicely with Gumroad, Teachable, LeadPages and more! They let you set up unlimited forms that can each deliver their own custom lead magnet (but you can send people through the same welcome email sequence). I figured I could hold off on buying LeadPages for a little while if I signed up for ConvertKit because it had the custom forms and opt-in giveaways that I wanted to be able to provide. Even though they’re a relatively new player in the email space, the company is transparent and looks to be on a steady growth curve. Check out their metrics here. The interface is easy to use and intuitive. Nathan has a background in design and user experience and it shows. 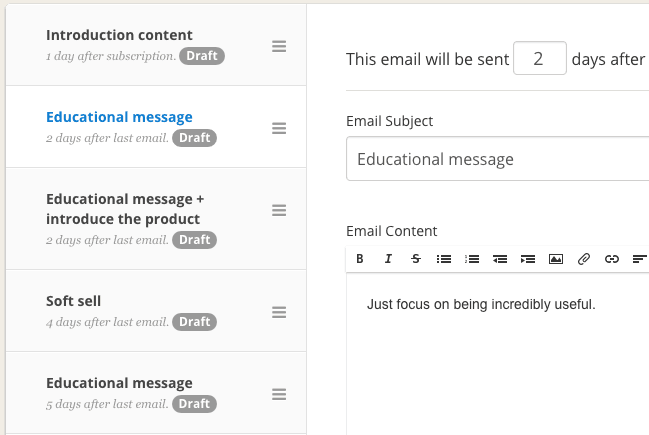 You can also drag and drop the emails to rearrange the order your emails go out within your sequence. See the little hamburger menu? Just click and drag. For example, let’s say you have a sequence with 2 “pitch” emails and several educational emails. Before the update for 2017, if someone bought, you might tag them as “purchased” and remove them from the entire sequence. But they would also stop getting your valuable content in the rest of the email sequence. Now you can just filter out purchases on that 2nd sales email. They will still receive your educational emails for the rest of that sequence. That way, you only send emails to people who actually want to read them. This will keep your open and engagement rates high, which will help your emails to keep getting into your customer’s inbox. Feel free to get creative, this is the fun part! 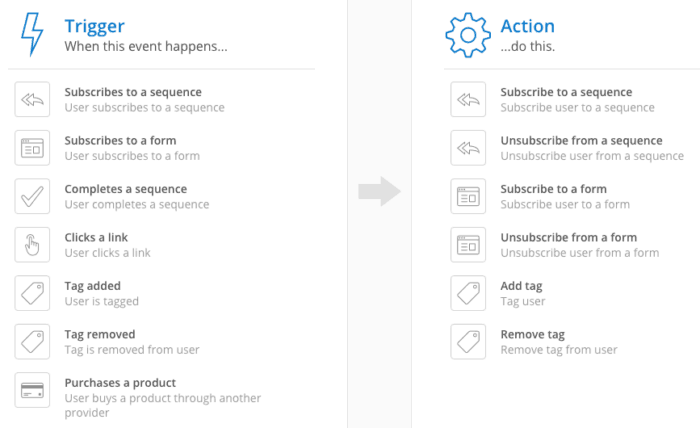 Check out the automation blueprints ConvertKit put together to help you get started. I’ll let them explain the process, but this makes it really easy to send an email to re-engage your cold subscribers. If they don’t respond or click, delete them. Every time someone signs up to your list, you should have them confirm their email address. 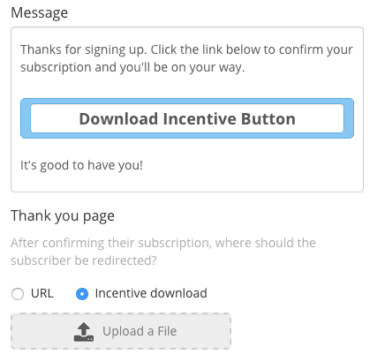 But one of the unique features with ConvertKit is that this ‘confirmation email’ can double as your lead magnet download. This saves your customer a step and just makes things really slick. Probably my favorite feature. No matter which page you send someone to through AdWords or Facebook Ads, you can set up a lead form or opt-in bribe that aligns perfectly with your ad and landing page. 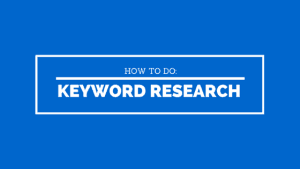 This will increase your conversion rates and lower your cost per lead. 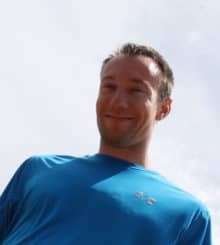 Simply write a series of emails that will automatically go out to keep educating and building the relationship on autopilot. Have multiple categories or services? Create separate sequences of emails (auto-responders in MailChimp lingo) that align with the category or service they subscribed on. Bonus tip: introduce your other services in your email sequence – think of this as a cross-sell. This means you can take a cold, never-heard-of-you-before audience and turn them into a warm (or hot) ready-to-buy customer while you continue to work on your business. If you have less than 2,000 subscribers and don’t need the automation features. You focus more on e-commerce and take advantage of MailChimp’s abandoned cart features (this is their specialty if you ask me – but ConvertKit does integrate with Shopify and WooCommerce). You need highly designed emails (these tend to not perform as well, but again, if you’re running at e-commerce store it makes sense that you use images more than most). Need a few more reasons why you should NOT switch? Check out this post. Have you switched to ConvertKit? Let me know how your experience has been. Still thinking about switching? I’m happy to answer any questions you might have (their support team is busy enough). Here’s to turning your email marketing up a few notches!